About 80 percent of Tanzanians are farmers most of whom are small-scale, who struggle to meet their basic needs and are thus likely not happy with their trade. Even when the weather is kind enough to provide them with the amount of rainfall they need to produce food and cash crops, the joy is short-lived because the timing of the following rainy season might be unpredictable, the amount of precipitation might go down and, in any case, the conventional farming method most of them still use does not guarantee them a good crop. The situation is further complicated by emerging challenges such as climate change, which has not only strained agricultural water supply but also reduced soil fertility through prolonged dry seasons and flash floods, among other things. However, Sharji Shaaban Khamis of Bungo Village in Zanzibar’s Kusini Region is among few small farmers who are generally happy with the fruits of their sweat, thanks to engaging in alternative farming method, organic farming, which has seen him beat the challenges brought about by changing weather patterns and earn enough money to meet the needs of his family. From his seven-hectare farm, Khamis gets a profit of about 800,000/- per month, which is in excess of vegetables, fruits and other farm products the family consumes from the farm. “This farm is the lifeline of my family; we get all our needs from here. I have managed to build a good house, I have a car and I meet the needs of all my four children who attend school,” he tells a group of journalists who visited him in order to learn about organic farming activities in the Isles. Asked about how he is coping up with the effects of climate change which has greatly affected small-scale farmers, Khamis said he has no problem with current climatic changes. “I hear people complaining about climate change but I have no problem with changing weather patterns. I cope very well with these changes and I can say we are friends,” he explains with a chuckle. He added, ”During the rainy season I collect water in the well and at the same time grow maize, cassava and pumpkins. When the dry season comes I grow vegetables and harvest fruits, and this is actually the time when I make money because the vegetables and fruits command a good market in the local tourist hotels . I have enough water to meet all my needs during the dry season and I am not bothered by climate change,” he says. His practice of organic farming begins with conserving the fertility of soil on his farm. He told the journalists that he has long abandoned the “slash and burn” type of farming and all crop residues is made into compost and used as manure. He also makes manure from green grass which is also plenty on the farm. This method, he says, preserves soil fertility and allows organism to produce more nutrients needed by crop plants. To treat the soil and make it more porous, Khamis mixes it with “coconut dust” produced by grinding coconut husks into fine particles. This is then mixed with soil where a seedling is planted. “Experts in organic farming have told us to mix the soil with sand, but experience has shown that sometimes the sand sticks to the soil and doesn’t allow in much air. The coconut dust has produced better results than sand; that is why we have decided to use it. After all it is freely available on the farm and we incur no financial costs in producing it,” he clarifies. In a bid to balance the consumption of soil nutrients by plants on the farm, Khamis engages in plant rotation whereby an area planted with tomatoes this season will be planted with beans or another crop the next season. This ensures that no single nutrient is exhausted from the soil and it gives such nutrients time to rejuvenate and so balance the availability of nutrients in the soil. When it comes to planting the seedlings, this farmer ensures that they are planted in rows, keeping the seedlings equidistant from one another. He says that this method ensures that each plant gets the amount of nutrients it requires and there is no “scrambling for food” among the plants as each of them has access to what it needs. “Contrary to the conventional method of planting seedlings haphazardly, this method helps the farmer to attend to the crop more carefully and leads to increased crop productivity,” Khamis said. Besides harvesting rainwater, Khamis also uses efficiently the water that is available for agriculture. One way of ensuring this is the use of drip irrigation which he says ensures that water is delivered to the plant and not anywhere else where it could be wasted. With most of the soil covered by mulch and plants, it has high capacity to retain moisture and this reduces the amount of water used for irrigation. Protecting crops from pests is another challenge that both organic and conventional farmers have to face. For those who grow fruits like Khamis, they have to deal with birds which blemish pawpaws, bananas and other fruits and so make them rejected by high-end markets. Here again, a natural way of dealing with the pests is employed. “Crows are a big menace here because they peck paw paws and bananas just when they start to ripen. Any fruits with blemishes are rejected by tourist hotels which are the main buyers of our products. To deal with the problem, we don’t harvest any fruits on the boundary of the farm and leave these to the birds. By doing so we keep them off the main crop on the farm because they will only attack the fruits on the periphery,” says Khamis’ brother Shabaan, adding that the method is good for both farmers and birds because at the end of the day they both get what they want. “The important thing here is to maintain and manage soil, water, plants and animals as well as conserve and use water efficiently in order to harvest a good crop. So at the end of the day you deal with climate change and ensure abundant supply of food,” Khamis said. At a recent discussion with journalists, an expert from Tanzania Organic Agriculture Movement (TOAM) Mike Farrley said that climate change has already severely affected agriculture in Africa and many people who depend on it have their lives in jeopardy. This, he says, calls for urgent need for adaptation in the sector, with organic farming providing one of the options. “Organic farming preserves and restores soil organic matter, maintains soil structure and improves water holding capacity and thus enabling it to maintain productivity in the event of drought and irregular rainy seasons. This adaptive quality is very important for the agricultural sector in Africa, a continent which is very vulnerable to the effects of climate change,” he explains. Beyond increased productivity, organic farming increases biodiversity by using trees and diverse crops, intercropping and crop rotations, all of which help to reduce pest outbreaks, severity of plant and animal diseases thereby increasing the production of high quality agricultural produce. It also encourages the use of local and indigenous farmer’s knowledge and blends this with modern science techniques. The use of drip irrigation, planting in rows and various methods of soil treatment are some of the scientific knowledge that blends well indigenous knowledge to make organic farming a success. According to the Intergovernmental Panel on Climate Change (IPCC), agriculture accounts for about 12 percent of global greenhouse gas (GHG) emissions, a figure which is expected to rise given the continued practice or conventional methods of agriculture. The slash-and-burn method, cultivation of peat land and expansion of farms into woodlands and forests all account for increased global greenhouse gas emissions. “Organic agriculture can significantly reduce carbon dioxide emissions and increase the capacity of nature to mitigate climate change and sequestrate significant quantities of atmospheric carbon dioxide, especially in the soil. The current estimate is that organic agriculture has potential to sequester up to the equivalent of 32 percent of all man-made greenhouse gas emissions,” says Farrley, adding that in organic agriculture less fossil energy is used since soil fertility is maintained through farm internal inputs such as organic manure, legume production and wide crop rotation while the energy-demanding chemical fertilizers and plant protection agents are prohibited. The Food and Agricultural Organisation (FAO) strongly promotes organic farming because organic farming systems have a strong potential for building resilient food systems in the face of uncertainties, through farm diversification and building soil fertility with organic matter. “In developing countries, organic farming systems achieve equal or even higher yields compared to the current conventional practices, which translate into a potentially important option for food security and sustainable livelihoods for the rural poor in terms of climate change. Certified organic products fetch higher incomes for farmers than other options and can thus promote climate-friendly farming practices. ” says the organizations in one of its statements issued in 2010. Prof Willy Makundi, Director of the (proposed) Kilimanjaro International Climate Change Centre says that organic farming is one of the adaptation routes that can be used by farmers. This type of agriculture uses organic fertilizers and organic crop and yield protection.” Organic fertilizers such as manure, mulching and compost are good for the soil amendment as well as moisture preservation, while having little or no net greenhouse gas (GHG) emissions,” he notes. Prof Makundi who is also a Climate Change Advisor to the Government of Rwanda highlights the contrast to conventional agriculture that uses chemical fertilizers and pesticides. He says that inorganic fertilizers such as ammonia sulphate emit large amounts of greenhouse gases, especially nitrous oxide and other oxides of nitrogen. “When these are substituted by organic fertilizers the farmer reduces the atmospheric concentration of greenhouse gases that cause global warming. It is however noteworthy that extensive large scale agricultural production is not possible (or not competitive) using organic fertilizers,” he explains. Methane emission can be reduced by applying appropriate animal husbandry techniques including amendment of animal feed, increasing the efficiency of animal products such as meat and milk per animal and capture and utilization of methane from animal waste for energy production (biogas). Other methods are reducing the use of inorganic fertilizers as well as the use of conservation agriculture to reduce carbon emissions from soil erosion. “Conservation agriculture includes practices such as terracing, mulching and minimum tillage,” he says. Prof Pius Yanda, Chair of the Mwalimu Julius Nyerere Professorial Chair In Environment and Climate Change at the University of Dar es Salaam concurs that organic farming is one of the best ways to adapt to climate change. “Here we are talking about small farmers who are most affected by the impacts of climate change. For them, organic farming helps their farms to maintain the capacity to retain water and so become not susceptible to prolonged dry seasons or even drought. And since they use fertilizer made from natural ingredients such as crop residue and compost, soil fertility is maintained and due to intercropping and crop rotation, organic farming promotes sustainable agriculture,” he said. He says that current trends in food markets also promote organic farming because such products fetch very high prices. This encourages more farmers to turn to this alternative farming method and abandon the traditional farming method of using chemical fertilizers and pesticides and expanding farms all of which eventually accelerate climate change. However, Prof Yanda said that organic farming is not very popular among large scale farmers, particularly in developing countries because of the work involved. “Preparation of compost and soil treatment, for example, are tedious processes for large-scale farming. Some commercial farmers prefer to grow only one crop in an area instead of mixing several crops or engaging in agroforestry and this has made organic farming unpopular among some large-scale commercial farmers,” he said, adding that the intensity of climate change effects and market forces will in the long run force these farmers to undertake organic farming. Categories: Local | Tags: climate change, forumcc, organic farming, tanzania, toam | Permalink. He talks more about the doings of modern societies and every time he moves from one homestead to another everybody can tell his way from the trail of dust that follows his motorcycle. On meeting Ngaiyok Legilisho Kipainoi many of his long-time friends would assume he had been out of his native Mairowa pastoral village for some time and has just returned. In reality Kipainoi, 35, is already in a world away from the destitution and social tension that gripped the north-eastern Tanzania rangelands in 2009 in the wake of a devastating drought. The past three years or so have seen the worst socio-economic crisis in the Maasai pastoral communities in recent history. The drought has immensely cost the nation in lost productivity, but traditional cattle breeders in this area compute its toll on the decimated herds of livestock. Available figures show that Longido District in Arusha Region, suffered a loss of at least 120,000 head of cattle, which was slightly over half of its total herd of 200,000. The drought’s impact on the people’s lives and their livestock is still visible in many villages of Engarenaibor ward even after recent rains brought back a flush of green on the ground. But the good news is that, together with the improved weather condition, there is a gradual turnaround of the pastoralists’ way of life. While they boast of owning thousands of cattle, only a few dozen have survived and breeders admit, they have now realised that real wealth is not in big herds. “The days of keeping many heads of cattle for prestige are gone—thanks to the 2009 drought. It has taught us a lesson. A lesson to adapt to climate change,” said Kipainoi. Indeed the lesson has come home to every pastoralist as they strive for a fresh interaction with the environment. Being able to cope with climate change, however, has not enabled them to escape from poverty. For many years, the Maasai pastoralists had resisted government pressure and persuasion to destock their herds until the drought opened their eyes to see livestock as a commodity. “We have started selling our animals and we use the proceeds to build decent homes or pay school fees for our children,” explained Kipainoi, who has a family of two wives and six children. All children are attending primary school. At the onset of the drought Kipainoi boasted a herd of 480 cattle, but he emerged from the catastrophe with less than half of the stock. “After the drought we realised that our local Zebu breed can withstand adverse weather conditions and are well adapted to the environment. 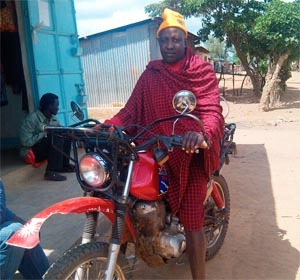 So, if we are to improve earnings from livestock, without risking another loss to drought, we must practise proper animal husbandry,” Kipainoi emphasised as he stood by his new motorcycle at the construction site of his new home. Pastoralists are likely to remain vulnerable to climatic shocks if the right strategies and appropriate structures are not put in place to end overexploitation of natural pastures and water resources. According to Kipainoi, pastoralists in this district have started selective breeding in order to build up a productive stock that is also resilient to climatic changes. “This involves selling cattle that are weak and cross-breeding a new stock from animals that display strong characteristics of high productivity and resilience. For example, preferred animals are those that feed selectively on the range, can trek long distances and are resistant to local diseases,” he said. Ongoing experiments concentrate on cross-breeding exotic races with local Zebu and Borana cattle and popularisation of the Gabra goat breed. “Our plan is to ensure that calving takes place at the start of the short rainy season when fresh pastures enable cows to yield more milk. In that way calves stay healthy enough to survive their first dry spell and then benefit from the long rains before the long dry season sets in,” Kipainoi explained. Meanwhile, village elders, locally known as Laigwanani , in Engarenaibor ward have set restrictions on communal grazing areas reserved for a specific time of the year, known as ronjo, said Ngaya Samria, an elder of Sinoniki village. Samria, who lost 202 heads of cattle to the drought and now remains with 68, said the restrictions for management of pastureland are based on seasons. “The elders are responsible for general utilisation of natural resources and serve as the local authority that determines the carrying capacity of range areas,” he said. According to Samria, the Morani (young Maasai warriors) scout around for suitable rangeland but the final decision on land usage is taken by the elders. Individual households (manyatta) take care of their immediate surroundings where they keep milk cows and goats. To back up the pastoralists’ efforts, the Arusha-based Tanzania Natural Resource Forum (TNRF) has come up with a climate change adaptation project that focuses on the drylands of Longido, Monduli and Ngorongoro districts in Arusha region. This project is technically supported by the London-based International Institute for Environment and Development (IIED) with a view of improving Tanzania’s planning system so that it can adapt to climate change. Similar projects are under way in Ethiopia, Kenya and Nepal, said Ced Hesse, IIED researcher on drylands development issues. “I think the project idea that TNRF and IIED are pursuing is quite good, especially the process they have taken of involving major stakeholders in various steps. It is likely that it will be a success story,” remarked Abdallah Said Shah, Head of the International Union for Conservation of Nature (IUCN) in Tanzania. Since development planners usually do not consider climate change, it is important to undertake a mainstreaming process which would ensure that issues related to climate change are taken on board since they affect development programmes, Shah said. Hesse cautioned that climate change would hit Tanzania’s drylands earlier and harder than other regions of the country because of a historical legacy of limited and inappropriate development in those areas. “Dryland communities who have experienced severe droughts for hundreds of years have important strategies and institutions for adapting to climate change. They can, therefore, teach us something about adaptation,” Hesse noted. In his view, the problem is that the ability of local people to adapt to climate change has been eroded, not because their strategies are not good, but because modern laws and policies have ignored traditional knowledge and institutions. “This has left local people more vulnerable to climate change,” said Hesse, noting as another problem, the lack of complimentary effect between traditional and formal government planning systems. It is for this reason the IIED project seeks to improve the planning process, partly in view of the 2009 drought. “But it has a broader and longer-term perspective to strengthen the capacity of local governments in their planning systems so that they can better adapt to climate change that will result in more severe and more frequent droughts and floods in the future,” Hesse added. Carol Sorensen, TNRF coordinator, said villagers in drylands have realised that land use planning had either not been done or not been enforced. “They have discovered that water and rangelands should be better managed if they want to live off their herds. They have discovered that land is limited, and that crops and settlements need to be controlled and situated in the areas most suitable for these activities,” added Sorensen, a community-based natural resource management expert. Rangelands management systems have largely not been well understood by policy makers and politicians. And, according to experts in the field, this situation pertains not only in Tanzania but nearly everywhere pastoralists operate. Therefore, pastoralists should be legally guaranteed access to land and water in clearly demarcated areas since they too have wildlife interests at heart for the benefit of tourism, she said. Alais Morindat, IIED consultant on the project on mainstreaming climate change adaptation in drylands development planning in Tanzania, said the project was aimed at designing a longer-term action-research programme that will test approaches and mechanisms to mainstream climate change adaptation into pastoralists development planning. He said this preparatory phase is being implemented in partnership with the local government authorities of Monduli, Longido and Ngorongoro Districts, relevant national institutions such as the Tanzania Meteorological Agency, the Vice-President’s Office responsible for climate change, customary leaders and civil society organisations. Over 6000 thousands pastoralists were affected by the drought in the six districts. Mr Morindat said the 2009 drought has changed the pastoralists’ perception and way of life. “It has also forced or rather challenged them re-think about their future and a need of for them re think about their future and a need for them to adopt scenarios planing.That is to say they have to plan for when the rains are good and at the same time plan for a situation when the rains are bad or poor”, he said. Longido. Miseries and anguish inflicted on pastoral communities of Longido district in Arusha region by the 2009 drought that was attributed to climate change are still fresh in the minds of its surviving victims. Folks here recall incidents of heart attacks and sudden deaths that gripped communities in the wake of the devastating drought. Apparently, the old man was not overjoyed, but he was shocked by the new demand because the drought had just wiped out his herd of over 2,000 cattle while he shouldered a burden of responsibilities, including care for over 20 wives, several children and grandchildren. He never recovered and passed away. 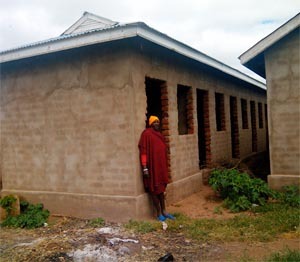 Joshua Emmanuel Laizer, a teacher at Sinoniki Primary School in Engarenaibor ward, was helpless to staunch the stream of dropouts from the school. “Parents discontinue girls’ education to marry them off so that they can get cattle in terms of dowry to compensate for what they lost in 2009,” he explains. According to the teacher, boys are also compelled to drop out of school by parents who send them across the border to Kenya to tend cattle and get paid a goat at the end of the month. Sinoniki Primary School is located 10 kilometres from the Tanzania-Kenyan border. “A girl is exchanged for four or five cows. And they use the cows and goats as capital for restarting pastoral life since the drought left them empty handed,” says Laizer. In 2011 six girls and 10 boys were selected to join secondary education but only one girl made it and the rest were married while the boys proceeded to Kenya to graze cattle. “The 2009 drought was a baptism of fire to my family,” says Ngaiyok Legilisho Kipainoi, a 35-year-old pastoralist of Mairowa village in Engarenaibor ward. He has two wives and six children who are attending primary school. The drought cut down his herd from 450 to 200 heads of cattle. Kipainoi recalls with bitterness that he had to sell a cattle for between Sh2,000 and Sh5,000 because buyers of the emaciated stock were after hides and left carcasses for scavenging hyenas to feed on. A healthy cattle goes for up to Sh650,000. The drought forced many cattle herders to migrate from Longido to Manyara and Ngorogoro areas in search of water and pasture, but would-be host communities were inhospitable. In times of disaster women and children are usually the most vulnerable. For 40-year-old Mrs Nondomi Lesanga: “It was a very trying period. As women, we had to look after children single-handedly. Men left us behind with children and goats,” she said. Categories: Local | Tags: arusha, cc, climate change, drylands, forumcc, longido, maasai | Permalink.